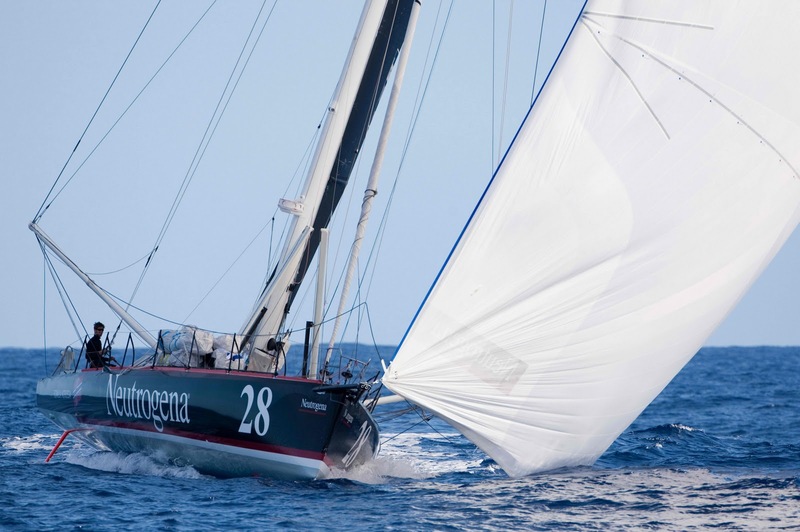 Fast sailing in the NE’ly trade winds, one of the most enjoyable stages of round the world racing, has been order of the day for the top 10 boats in the Barcelona World Race. Plunging downwind in winds from 20-25 knots, with the odd stronger gust to keep the helms’ on their toes, has provided high speeds for the leading duos who have all been averaging more than 15 knots, and the second half of the fleet at least 10 knots. 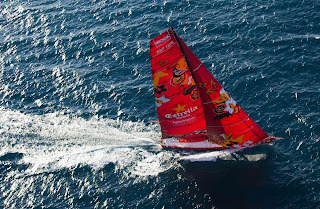 At such speeds, such as François Gabart on Foncia reported their top mark so far at 24.3 knots today, full foul weather gear is required in the cockpit, especially considering that the seas remain slightly chaotic and disorganised and the leaders were all reporting wet condit ions on deck. 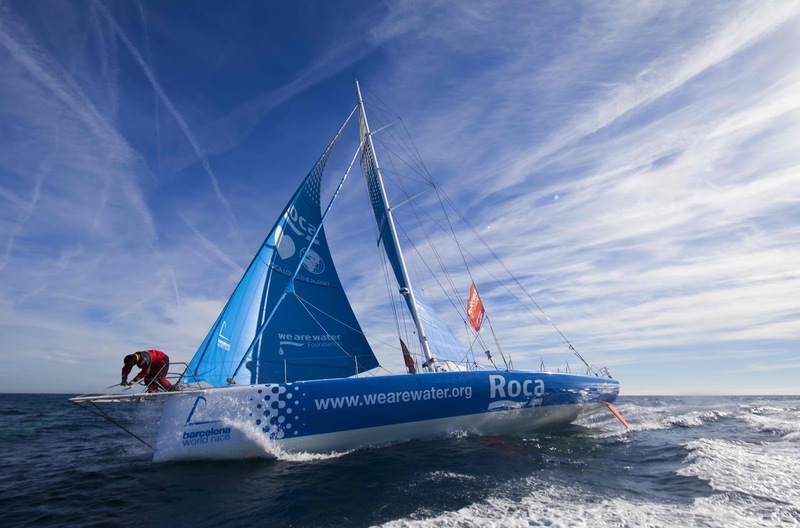 In such conditions con centration and focus is vital to keep the IMOCA Open 60’s at full speed for the sea state and not necessarily the wind conditions. 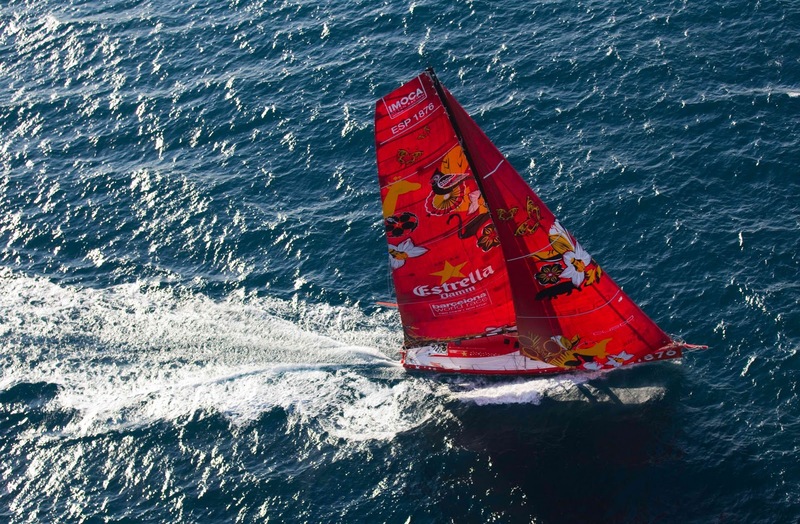 Spanish duos Mapfre and Estrella Damm have shown thee virtue of their respective training, experience and optimisation. Olympic medallists Iker Martinez and Xabi Fernandez have been consistently quick, in fifth leading the group of 5, by 13 miles this afternoon but with a very strong westerly position already banked. Their downwind speeds have been regularly excellent over the last 48 hours perhaps underlining some of their cohesion honed as the most successful 49er skiff crew of their generation. And Barcelona based Alex Pella and Pepe Ribes confirmed that their work rate through last night, making four or five gybes to stay at the best possible angles, was part of the reason that Estrella Dammhas spent the day in third place and now moved 10 miles clear of their fourth placed rivals, Dominique Wavre (SUI) and Michèle Paret (FRA) on Mirabaud. The leding duo should pass the Cape Verde islands within the between Monday night and Tuesday morning, presenting their next strategic decision: whether to route through the islands or outside to the west. 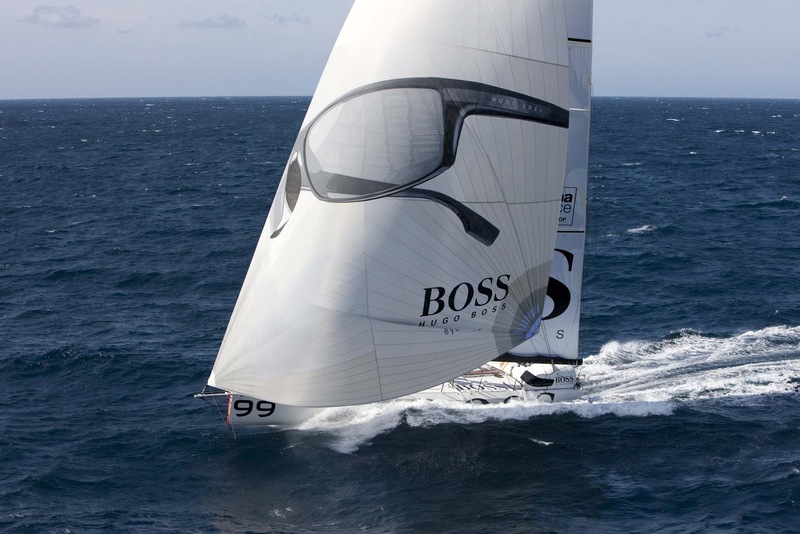 Meantime Alex Thomson, the British skipper of Hugo Boss, has received the medical green light he required to join his IMOCA O pen 60. And Dee Caffari (GBR) pledged that it is catch-up time now for her and Anna Corbella (ESP) on GAES Centros Auditivos after losing miles to their main rivals. A clean up of the boat yesterday and, then a refreshing sea-water shower for the girls today, Caffari felt was indicative that their tactical errors at Madeira were in the past and now was their time for fast sailing. The B ritish skipper, Alex Thomson, has today been declared medically fit to join the Barcelona World Race after making a satisfactory recovery from the emergency appendectomy on 29th De cember which prevented him from starting second edition of the two handed round the world race on Friday 31stDecember. Thomson had a full medical examination by offshore sailing medical specialist Dr Spike Briggs (GBR) in England on 8th January 2011, which was transferred Dr Francesc Bonet , the Barcelona World Race’s chief medical officer, and approved by Race Direction this morning. It is confirmed that Thomson has fulfilled the medical criteria as specified by Rider Number 12 of the Barcelona World Race Notice of Race, which required he present approved medical certification that he is medically fit to go racing. The change of crew, replacing substitute co-skipper Wouter Verbraak (NED), will be overseen by Technical Measurer and Scrutineer, David Moreno (ESP), who will attend the changeover and ensure that the swap fully complies with Rider N°12 of the NOR. Logistical planning is under way to have Thomson join his IMOCA Open 60 Hugo Boss in the Cape Verde Islands. The plan is required to be confirmed and approved by Race Direction of the Barcelona World Race and will be presented this Sunday evening.